Oh...Sew! Organized Stash n Store - Gray. The new Stash n Store is the perfect device to keep your sewing and crafting notions within arm's reach, easily visible and ready to go. Store marking tools, scissors, stilettos, rulers, pressing tools, even brushes and small rotary cutters, in an easy-to- grab upright position. The Stash n Store's silicone pockets are smooth, have a sturdy grip, and are simple to clean. Simply pull off the silicone layer, give it a rinse, and pop it back in place. 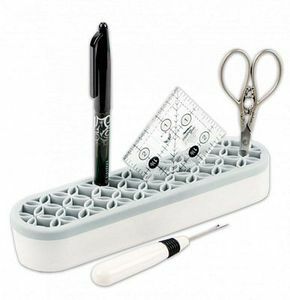 Also, the beautiful pocket design offers a small and large space for a great fit for any notion. Available in three colors - Mint, Pink and Gray. Sleek, stylish and practical, no quilter can resist having a few stashed away!